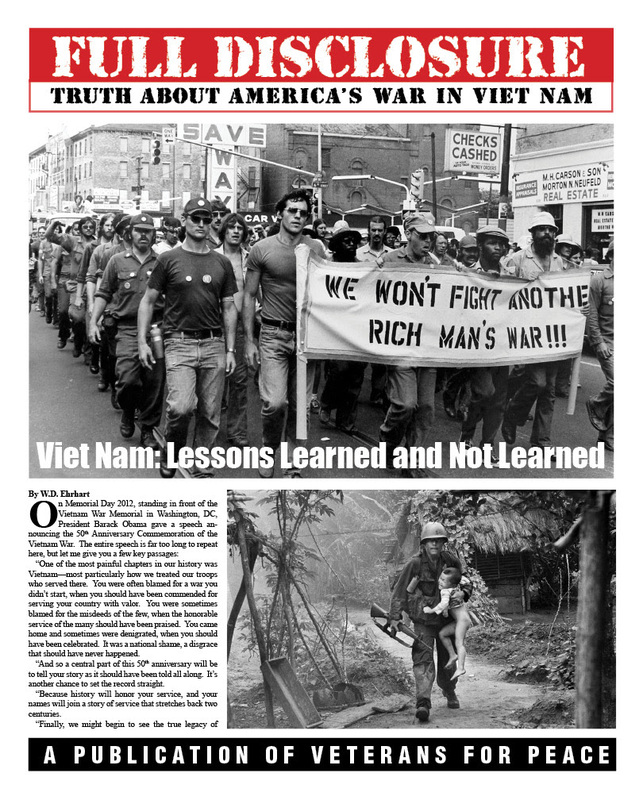 We have been working on an exclusive edition of Full Disclosure – Truth About America’s War in Viet Nam, specifically designed to counter the Pentagon’s Vietnam War Commemoration revisionist campaign to mythologize that war. The 24-page paper is loaded with the unadorned truth about the American war in Vietnam from those who fought in it and from those who fought against it. We are especially proud to be featuring two perspectives the Pentagon refuses to seriously acknowledge — the Vietnamese people and the G.I. Resistance movement. We are confident that this one-time publication will become a valued resource as well as a collector’s item. The paper will go to print the week of March 21st. Don’t miss out. You can order an individual issue, 5 issues or a bundle of 80 here.